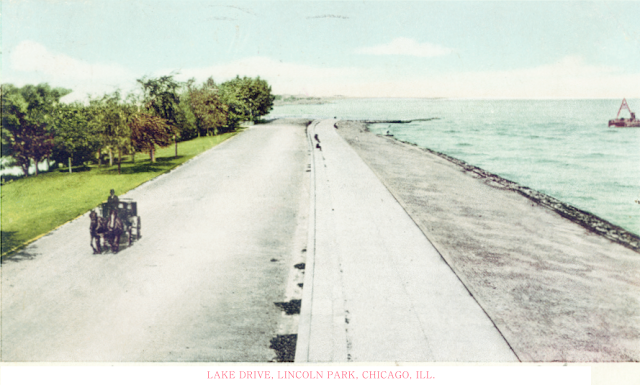 The Digital Research Library of Illinois History Journal™: The History of Chicago's Famous Lake Shore Drive. 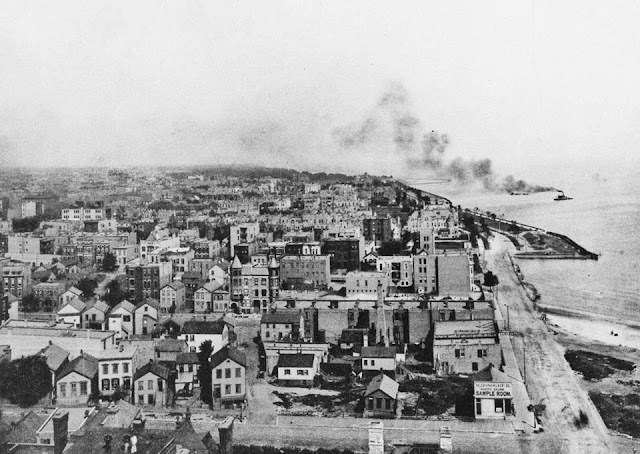 Lake Shore Drive in 1889 taken from the top of the Chicago Water Tower. 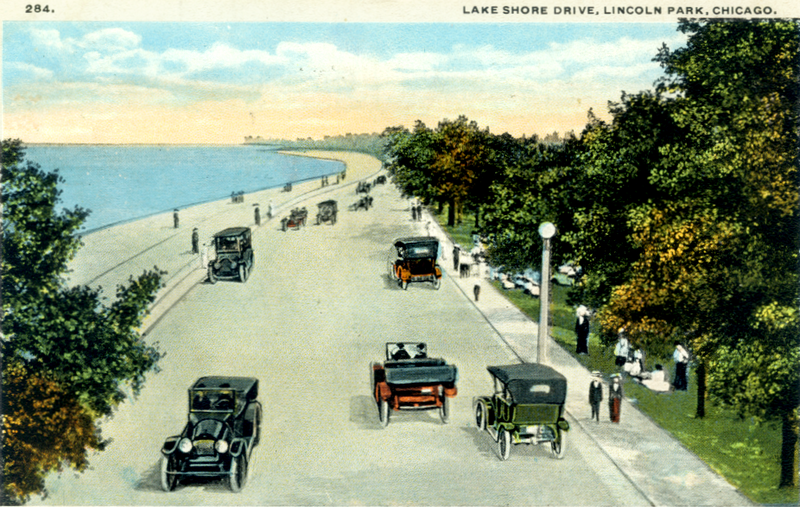 Lake Shore Drive (referred to as the Outer Drive, also as The Drive or LSD) is probably Chicago’s most famous road. 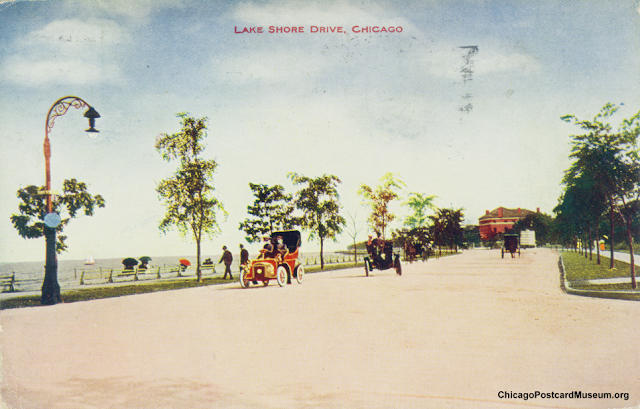 Lake Shore Drive's origins date back to Potter Palmer, who coerced the City of Chicago to build the street adjacent to his lakefront property to enhance its value. Palmer built his "castle" at 100 Lake Shore Drive in 1882 (today 1350 N. Lake Shore Drive) on land filled from debris from the Great Chicago Fire of 1871 east of today's Michigan Avenue which was known as Pine Street. 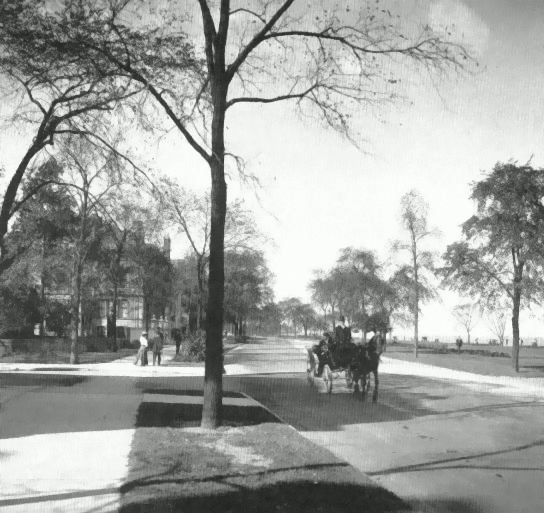 Pine was renamed to Lincoln Park Boulevard in the early 1890s as far south as Ohio Street when the street connected with Lake Shore Drive. 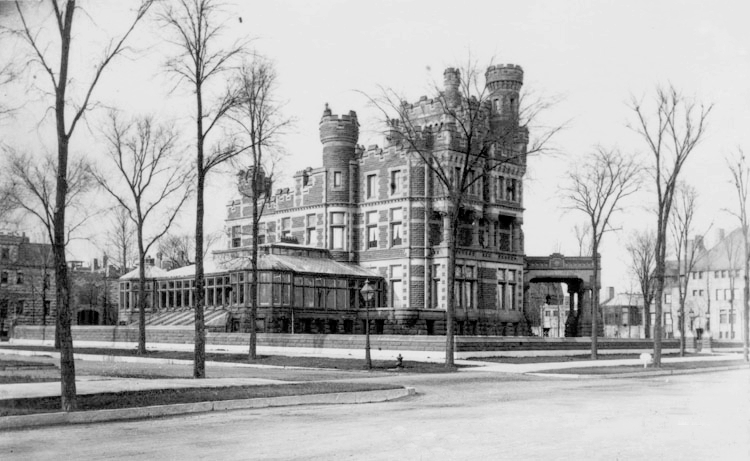 The Potter Palmer “castle” which stood on north Lake Shore Drive for more than half a century and remains one of the most legendary houses ever built in Chicago, despite the fact it was razed in 1950. The drive was originally intended for leisurely strolls for the wealthy in their horse-drawn carriages. When automobiles began growing in numbers, Lake Shore Drive took on a completely different role in transportation. On October 12, 1901, tens of thousands of flag-waving Scandinavian-Americans participated in events to celebrate the monument unveiling. Despite heavy rain that day, the festivities included a parade and a two-hour ceremony in Humboldt Park. Norwegian come to Chicago around the time of the 1893 World's Columbian Exposition. 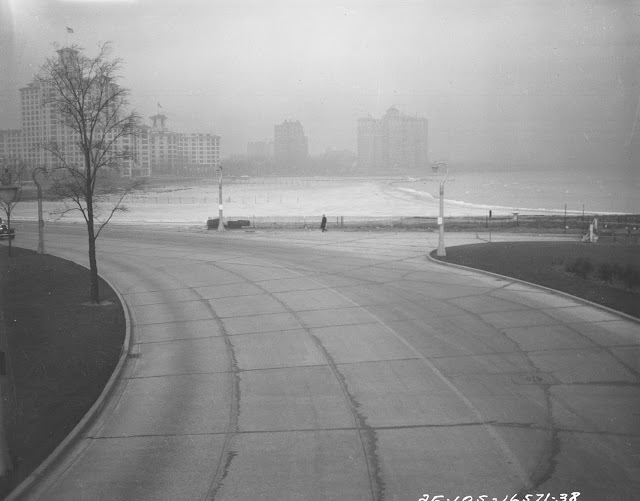 Lake Shore Drive began at Oak street and extended north to the city limit at Fullerton avenue. The most notable extension was built in 1933 from Belmont to Foster avenues which featured cloverleaf interchanges instead of at-grade intersections. This stretch of road was Chicago’s first freeway predating the Calumet expressway by 17 years. Leif Ericson Drive It Stays, Official Says. 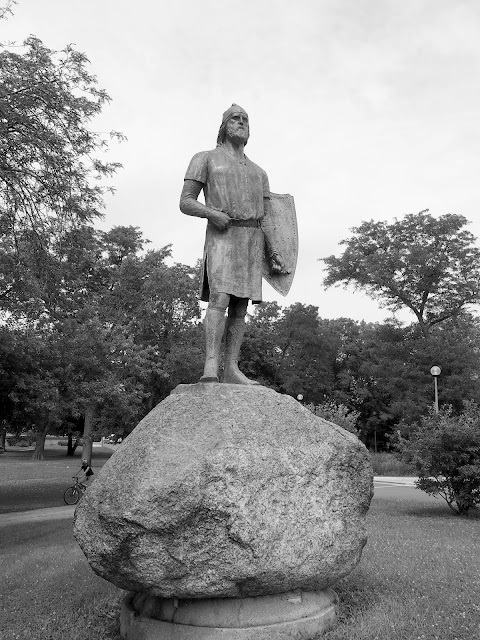 Despite the protests that have arisen, south park officials announced yesterday that they will stand by their decision to name the outer drive from twenty-third street to Jackson park for Leif Ericson, Viking, said to have landed in America in the year 1,000 AD. Supt. George T. Donoghue for the south park board, declared that unless people insist on stressing the name of Ericson, the boulevard will still be known as the Outer Drive just as Soldier Field popularly is known as the Stadium. "People will put their own Monikers on the the drive," Mr. Donoghue predicted, "Just as they call the drive through Lincoln park the West drive instead of Stockton drive, its proper name." The board, he said, has considered the matter for six months. Feeling that the man should be recognized and receiving corroboration from the University of Chicago as to the historical fact. Mr. Donoghue declared that the name had been given after due consideration. Several articles have appeared of late referring to the Leif Ericson Drive as the "Outer Drive." It is beyond me why this drive is not called by the name that was rightfully given it. As all know, Chicago chose to honor the discoverer of America, Leif Ericson, who landed on the mainland of America in the year 1,000, by naming this drive Leif Ericson Drive. The dedication of Leif Ericson Drive on September 11, 1927 attracted a crowd of 25,000 people, mostly of Norwegian birth or ancestry. As it happens, the Outer Drive which has been called Leif Ericson Drive could have been Wacker Drive and when all the work has been done that Wacker Drive could have been the fine boulevard from jackson to Lincoln Park, a more imposing memorial even than South Water Street, which is now Wacker Drive, The Tribune again questioned the propriety of it, although there nothing was being detached from the city's sense of the past, but the congruity of the name was questionable in that application. That controversy involved some of the city's substantial Norwegian citizens and The Tribune was supposed to have some prejudices in the matter, which was absurd. It presently involved some substantial Italian citizens who found in the Norwegian devotion to Ericson and implied reflection on Columbus and an intent to belittle his place in American History. In preparation for the 1933 Century of Progress World's Fair, Leif Ericson Drive was extended south to Jackson Park. 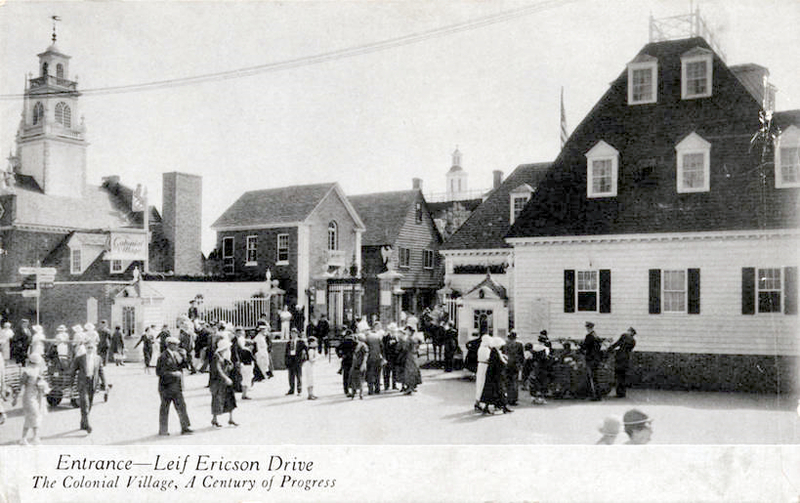 Leif Ericson Drive was one of many ticket booths and entrance/exit for the Fair. Entrance - Leif Ericson Drive, The Colonial Village, A Century of Progress 1933-34 Chicago World's Fair. Most references to "Leif Ericson Drive" online have a wrong date of 1937. Proven wrong by this World's Fair postcard. New Columbus Drive to match Up with Ericson. The outer drive which will connect the proposed series of five islands extending from Roosevelt Road to jackson park will be named the Christopher Columbus, the south park board decided yesterday. That action was taken at the request of a delegation of Italian-American citizens who came to protest against giving the name of Leif Ericson to the south parks' "inter outer" drive, now under construction. Oscar Durante, editor of L'Italia di Chicago Newspaper (aka: Courriere del l'Italia, Italian News, and Italian News of Chicago), and as and a school board trustee, thanked the commissioners and said that justice had been done for his countryman. Edward J. Kelly, president of the board, explained that the commissioners were not taking a stand on the question but that they had named the outer drive for Leif Ericson only as recognition of the Scandinavian population of Chicago. 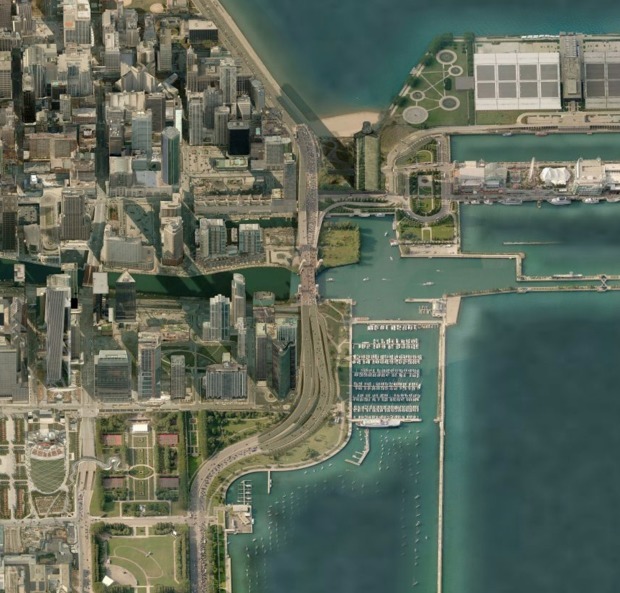 However, the north and south extensions did not connect as the Chicago River cut off the two roadways. 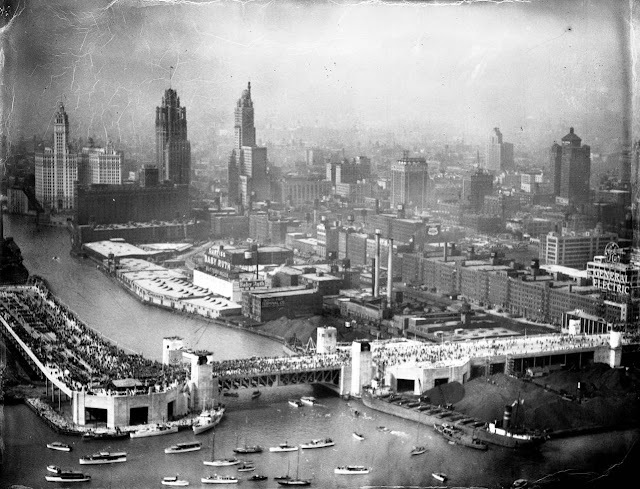 So in 1930 plans for an outer drive bridge over the Chicago River and its approaches was estimated to cost 5,750,000. The bridge, later known as the “S-curve,” opened Tuesday, September 28, 1937. Thousands attend the opening of the Outer Drive Bridge, also known as the Link Bridge, on what is now Lake Shore Drive at the mouth of the Chicago River on Oct. 5, 1937. 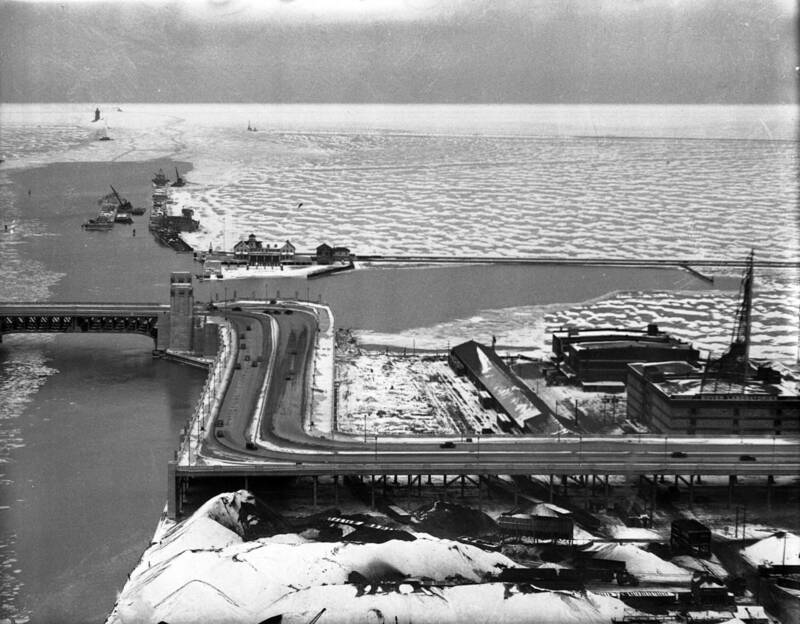 The bridge was intended to ease congestion on Michigan Avenue and in 1937 it was one of the longest, widest, and heaviest bascule bridges. 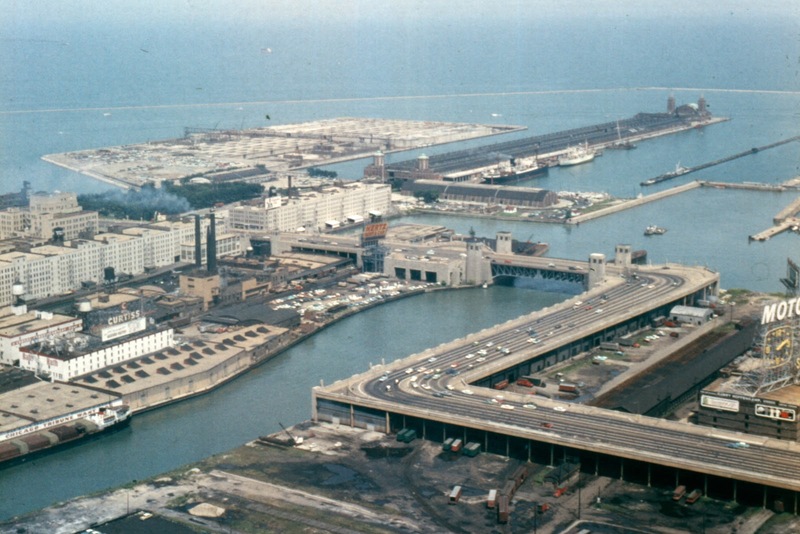 Note the Chicago Locks being built (between 1936-38) in the upper left of the picture. Lake Shore Drive S-curve and bridge. circa 1960s. Leif Ericson Drive continued to be called by its legal name, evident by newspaper articles, through 1939. Beginning in the mid-1940s a section north of North Avenue featured a unique, though problem-plagued, system of curb-high lane barriers (pretty blue lights) that could be raised or lowered (making reversible lanes) to provide six lanes in the direction of rush-hour traffic flow instead of the standard four lanes in each direction. The automatic lane barriers were removec in 1979. 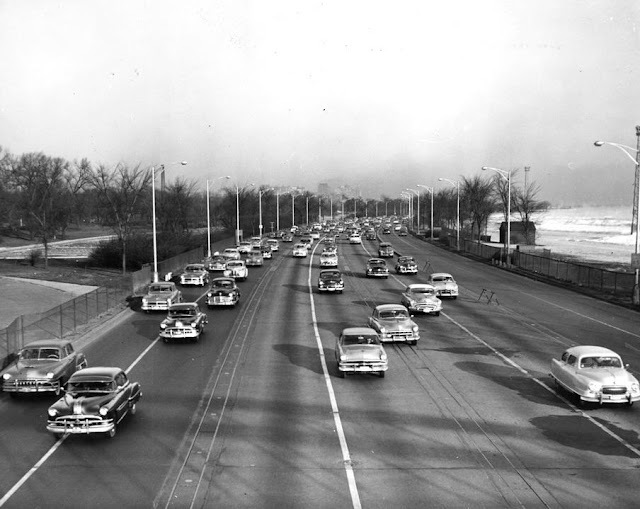 Lake Shore Drive with Reversible Lanes - Note the movable lane barriers are not functioning. Chicago's Lake Shore Drive with 6 inbound lanes and 2 outbound lanes during the morning rush-hour. More Bottlenecks. I have driven up and down the outer drive for the last few years watching the transformation of our boulevard system in Lincoln park. What was once a pleasant spot thru which to drive is now a concrete racetrack with ugly lamp-posts, stop lights and dizzy curves. What was meant to speed up traffic now retards it. Instead of one or two bottlenecks from the Loop to the north side we now have one continuous bottleneck. All this and millions of dollars spent, too. the men who are hired as engineers to eliminate traffic congestion could have done a better job. By Joseph S. Farina. 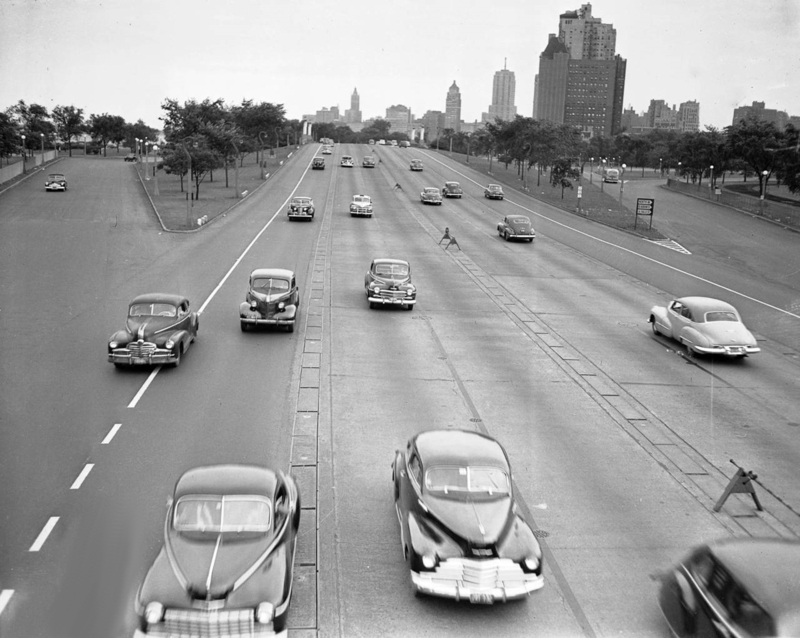 In 1946 the entire freeway was named Lake Shore Drive. The 1951–54 extension of Lake Shore Drive from Foster Avenue to Hollywood Avenue cut the hotel off from the beach leading to a reduction in business. The hotel closed in 1967 and the main buildings were demolished shortly after. In this 1938 photograph, Lake Shore Deive ends at Foster Avenue. you can see the Edgewater Hotel further North in the picture. Construction work at the intersection of Sheridan Road and Hollywood Avenue is completed in 1954. Vehicles coming from the north will turn east onto the outer drives extension, the new north side terminus of the outer drive. 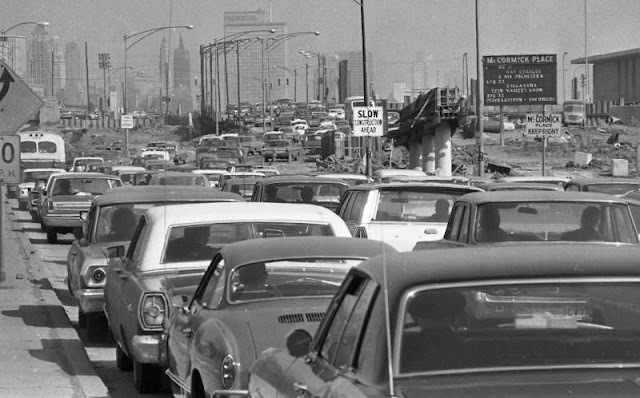 South Lake Shore Drive Heading North to Downtown in 1966. "Lake Shore Drive" is a song written by Skip Haynes of the Chicago-based rock group Aliotta Haynes Jeremiah wrote the song "Lake Shore Drive" in 1971 where he talks about the reversible lanes as: "Pretty blue lights along the way --- Helping you right on by." An additional reference in the songs lyrics says: "From rags on up to riches fifteen minutes you can fly" denotes driving from the south side to the Loop. Listen to the song "Lake Shore Drive." Mayor Michael Bilandic shut down the reversible lanes of the north side outer drive in 1979. During 1978, the last year in which the reversible lanes were used, seven persons died in accidents, largely involving head-on collisions between cars traveling in opposite directions and crossing the dividing lines. The current S-curve includes much gentler bends starting around Randolph Street and ending just before Monroe Street. Construction on the project began in 1982 and concluded in late 1986. 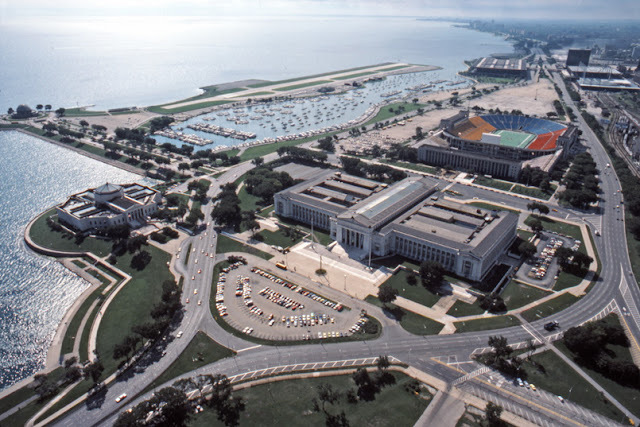 The Field Museum and Solider Field split of Lake Shore Drive. 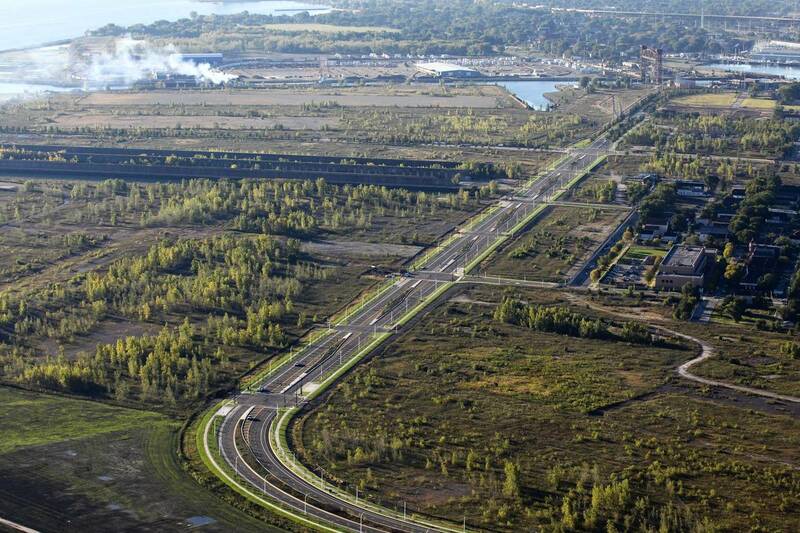 The Lake Shore Drive extension runs two lanes in each direction between 79th and 87th streets opened in October of 2013. 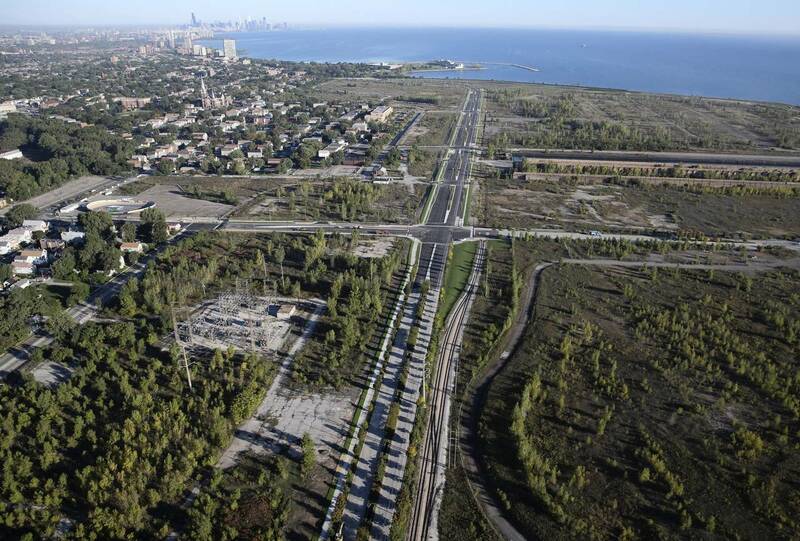 An aerial view, looking north, of the extension of Lake Shore Drive through former steel factory property on the far south side of Chicago near 79th Street and South Shore Drive. Looking south at the Lake Shore Drive extension. Interesting article: Don't know what it's like now, but whenever anyone complains about the traffic in Honolulu (which they do daily)I remember the times my father would pick me up after I'd been shopping downtown, and it would take 30 minutes to get from Michigan Ave & Randolph or Wabash to the the Heaven sent Outer Drive. As always, excellent history. I love LSD and we always have to take a joy ride on it when I come back to visit.